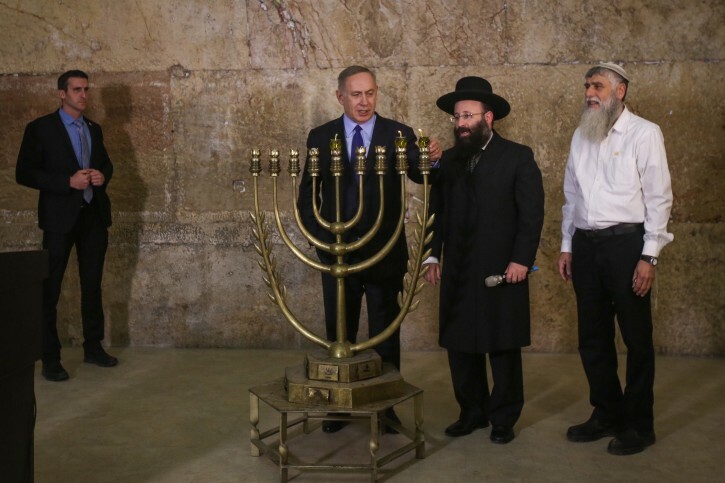 Jerusalem - Prime Minister Binyamin Netanyahu lit the second Hanukkah candle at the Western Wall Sunday night, accompanied by Rabbi Shmuel Rabbinowitz, the Rabbi of the Western Wall. The UN resolution states that all so-called Jewish ‘settlements’ over the 1949 Armistice line are illegal, including the Jewish Quarter of the old city of Jerusalem. “According to the UN resolution, the villages that they left in Modiin [to fight the Greeks] and the surrounding areas, the villages and their surroundings, were all ‘occupied Palestinian territories.’” he said. “Of course, we know that the Arabs came much later. We were in those places [when the Hanukkah story took place, a millenium before the Arabs arrived]. We returned to those places. I ask those nations wishing us a happy Hanukkah - how can they vote for a UN resolution which says that the places where we celebrate Hanukkah [and where the story toook place] are ‘occupied territory?’” Netanyahu asked. Mr' bibi: pls stop crying..... enough just stop fighting with the whole world & sit down to talks with the arabs & everything will be ok, & wait for GOD to give us back isreal. “ Mr' bibi: pls stop crying..... enough just stop fighting with the whole world & sit down to talks with the arabs & everything will be ok, & wait for GOD to give us back isreal. Didn't all of the signers of that condemnation realize that it cleaned away all previous signed agreements by both parties. Ever since we became a nation, we where facing enemies. and we always had brothers siding with them. When moshiach will come, hopefully today! The side I want to be on is our side, and not with the kind of you. Who is always ready to energize the enemy against us jews. #1 god did give it back, but you failed to acknowledge his gift. Let's see how long you'll be "LOL'ing" when Pres. Trump takes office and makes Israel our number one friend!!! Hope you choke on it, you NK sicko illiterate. ALTERG is not a liberal, he's an NK hater of Israel! Why is everyone so surprised? Isn't this all predicted in our Torah? In Golus, all the nations hate Israel and the Jews because of their envy of our status as the chosen ones. You are probably not familiar with Mr. Alterg. He is not liberal, he is against Bibi's position because Mr. Alterg is aligned with the Satmar thinking about the land/government of Israel. As far as Mr. Trump's position - his Secretary of State is an OIL man. Hope this does not sway him towards the Arabs. I wish Mr. Trump luck in moving the American embassy to Yerushalayim - hope he can do it, and safely with no repercussions. Every recent U.S. president has tried but the same obstacles that have prevented Clinton, GW Bush, and Obama are still at play. Also hope it does not provoke Israel's enemies towards an all out war. Very scary for all of us, especially living in Israel. Lol for your illiterate lack of writing skills... "Candeling?" A new word you made up? How's Arafat Y's whom your leader kissed, you shtick NK drek? Yidden, we only have to wait another 25 days more, before the muslim loving and drug dealer commuting President is out of the White House for good. Every Shul in the world should sponsor a Kiddish, the Shabbos after Obama leaves office. It can't happen soon enough! !